I'm not sure when I first read about Super Randonnées; but almost as soon as I did, I knew I had to ride one or more of them. The concept of Super Randonnée (organised and validated by Audax Club Parisian) is a permanent event of 600km with a minimum of 10000 metres of ascent, but with a time limit of 50 hours with an additional hour per 500 metres of ascent (over 10000 metres). There are currently 4 Super Randonnée available and one of the newest is the Pyrenean one. 2013 is the first season it has been available and I was due to be the 5th person to attempt it (of which 1 person had DNF'd). This ride was, on paper, the hardest Super Randonnée available, with a staggering 15000 metres of climbing giving it a time limit of 60 hours. The ride took in a huge number of climbs, some of them iconic sites of great battles from the history of the Tour de France, and some were very rarely visited by, well, anyone. The organiser, Sophie, was very helpful with advice and updates from other riders as I began to prepare for the trip. More than any ride I have ever ridden, I needed to create a schedule and look at how to break the adventure up. 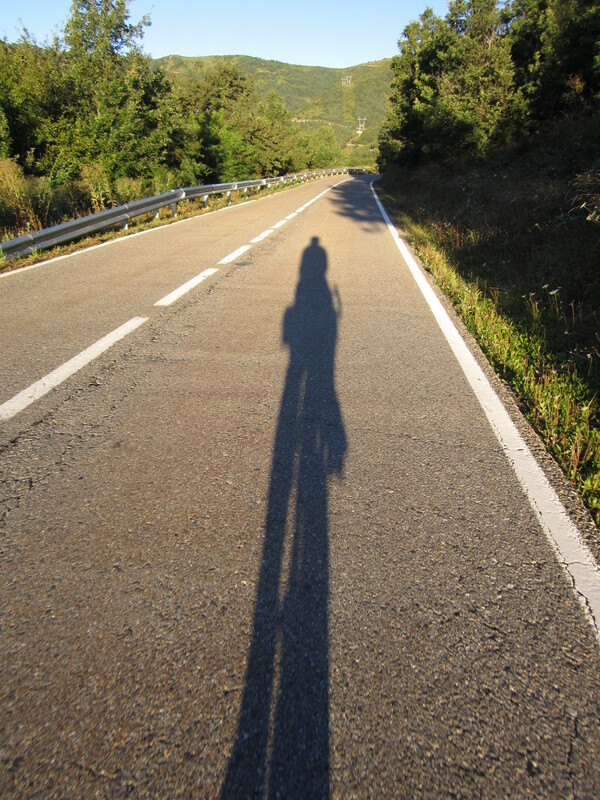 This ride goes through some pretty sparsely populated areas and hotels can be few and far between, particularly in the Spanish sections. I elected to ride in mid-September to round out a great season. There was a risk of poor weather, and watching the pros suffering horribly in the Vuelta d'Espagna only a couple of days before leaving, only added to the tension. Theoretically, this was an easy ride to get to. It started and finished around 15km south of Lourdes, where Ryanair have flights twice a week from Stanstead. I say theoretically. As I sat at the departure gate, I heard an announcement that no-one ever wants to hear. The words “flight”, “cancelled”, “French baggage handlers” and “strike” were all used during the course of the announcement. Sheer bloody-mindedness is a trait that is almost compulsory to achieve anything in Audax, so no way was a spot strike going to stop me. If I didn't ride now, it could well be June before I could attempt it again as winter is not far off up in the mountains. I discovered that the strike was only affecting Lourdes. So, looking at options, I found an EasyJet flight to Toulouse (having rejected a BA flight to Bairritz for £800!). From Toulouse, it would be around a 2 hour train journey to Lourdes. I would arrive around 12 hours later than planned, leaving little time for rebuilding the bike and generally acclimatising and so on; but I would get there! As I boarded the coach to Gatwick, I met another person with the same exact plan, except Kit's (a French student who studied in Edinburgh) father was driving up to Toulouse to give her a lift home. She offered me a lift, on the proviso that the bike box would fit in the car. Fortunately, it did, and I found myself in Lourdes unpacking and rebuilding my bike in an Ibis hotel room that was barely large enough to lay the bike box down. An early night and an early start to get down to the start town of Argelès-Gazost and I was off. The ride started with one of the most iconic climbs of them all. 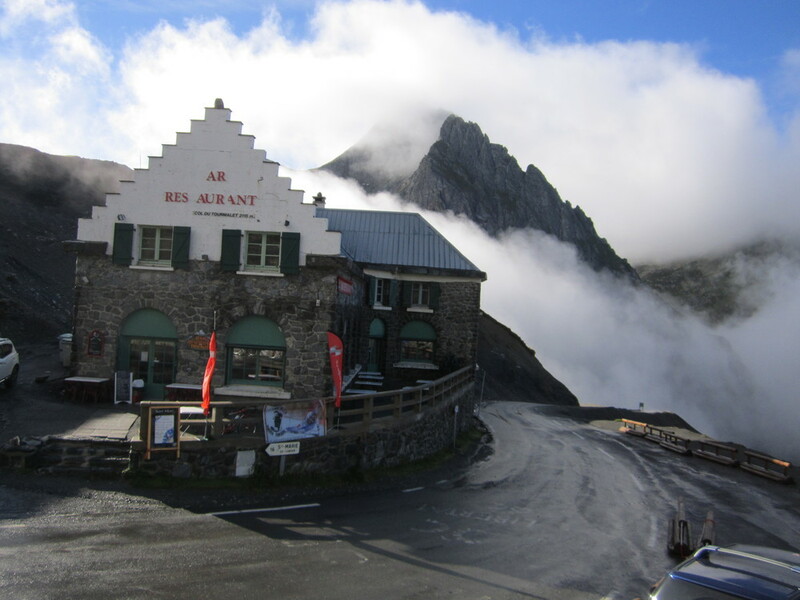 Col du Tourmalet has been visited by the Tour de France a staggering 82 times so far (and is rumoured to be visited twice in the 2014 edition). 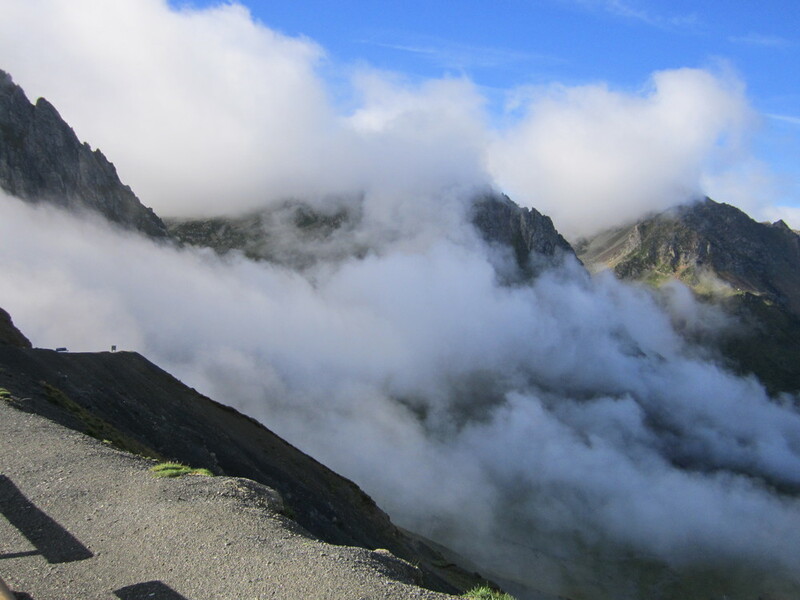 The western approach of Tourmalet was devastated by the terrible floods in June. 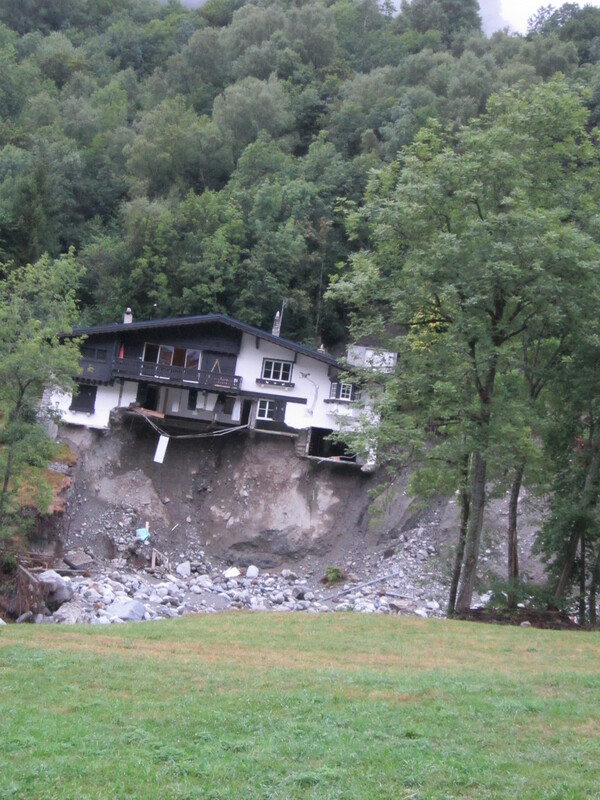 It was horrifying to see the damage for myself as I climbed through the town of Bareges. The road itself had been washed away in many places and the work to repair it seemed to involve just about every JCB and truck in France. As the climb progresses, the writing starts to appear on the road; this is what I came for, I was pedalling on the shoulders of giants. Tourmalet is a very long climb, but not exceptionally steep. Despite the sun coming up, it was very very cold at the top. My Garmin was reading 2 degrees, but the wind and being in the clouds made it very uncomfortable at the top. I had been advised that the café on top 'probably' opened at 9am, and I was very relieved to find that was true. I drank a coffee and ate a sandwich as I added some layers ready for the descent. As I descended for the next 20km, I was amazed by the number of cyclists heading up to the top. It must be so busy in summer. The ride went from an incredibly famous climb to one little travelled by anyone it seemed. Col de Sarrat de Gaye was superb and really whetted my appetite for the days ahead as I was now in some remote, picturesque mountainscapes. The day progressed and I ticked off climb after climb including many well-known ones like Hourquette d'Ancizan, Col de Peyresourde and Col du Portillon into Spain. Whilst I felt pretty good, I was getting concerned about my progress. Day one was always going to be hard, but I had felt that 18 hours to cover 240km, even with over 6000m of climbing was going to be fine. I had to be at my hotel before midnight and my progress was just not quick enough. I had another 2000m pass (Port de la Bonaigua) to get across and I was getting concerned. Though, I did know that once I reached the top, I had 50 kilometres of descent to the town of Sort. I cautiously estimated that I would cover that 50km in under 2 hours, so I began to relax a little as I settled into the climb of Bonaigua. A very long climb, but not exceptionally steep. It was very cold towards the top and I stopped to get my proof of passage (a photo of the summit sign) and put on extra layers for the long descent. I love descending in the big mountains, and doing it at night was a real thrill. 70kph felt more like 1000! Clearly, there is a need for caution, there are many animals in the high mountains who will wander around the road without concern. Once the main descent was over, I had around 20km of gradual downhill to the hotel. However, there was an issue, I was getting the dozies. Badly. Two mornings of being up at before 5am were taking their toll and I was really in a bad way. As I have got older and wiser, I have recognised just how dangerous the dozies are and know to stop immediately and get a power nap at minimum. However, even a 20 minute stop would put getting to the hotel in time in jeopardy. So, I had no choice, I had to push on or I would be sleeping out all night, and it was very cold indeed. I played every trick I knew, I pushed hard out of the saddle, I had some upbeat tunes on the iPod (Deadmau5 for the record) and I just about stayed awake. I reached the hotel about 11:45 and, well, it was closed. No lights on. Well that was a blow. There was a buzzer, I pressed it, I was worried I would be waking someone, but the website had said reception was open until midnight, and I really didn't fancy sleeping outside on a very cold night, so I didn't worry too much about disturbing someone's sleep. Luckily, I didn't actually wake the young chap who answered the door and he was fine with sorting me out with my key etc. It felt great to be in the warm after a very cold few hours in the dark. I was pretty soon asleep and got nearly 5 hours of fabulous sleep. It had honestly been one of the hardest days I have ever ridden on a bike. Just under 6800m of ascent in, roughly, the 190km to the top of Port de la Bonaigua! Showered, rested and in clean gear, I set off into the chilly pre-dawn and got to enjoy a truly fabulous sunrise as I climbed up towards the village of Peremea. This section was really very beautiful and very remote, it was one of my favourite parts of the whole ride. I did, however, have an issue, breakfast. Due to rushing to the hotel, I hadn't eaten dinner and now I was riding through the middle of nowhere where the opportunities for food were minimal. I did have some cake snacks in the saddlebag, but I really wanted something more. Water was also becoming an issue. 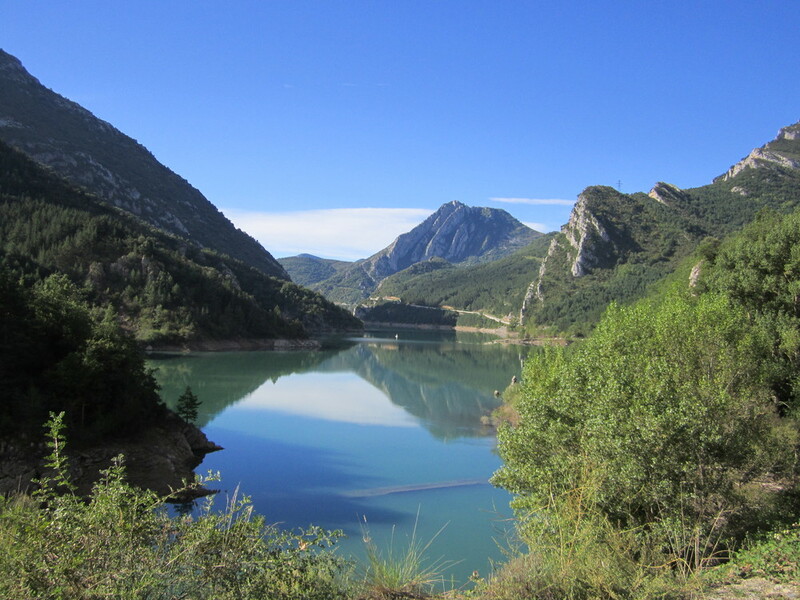 I had to work my way over the climb of La Creu de Perves in ever warming temperatures without water. At least the sign at the top amused me, the reported altitude was 1334.9 metres. I had never seen a sign with such accuracy! I finally made it to a town, where breakfast, coffee and a refill of bottles was all sorted. The 6 or so kilometres following the N-230 was the only part of the entire route where traffic was an issue. Sophie had noted it in the route sheet as being a road with lots of lorries and so on. It didn't spoil the ride in any way at all, but it was a rude awakening after so many kilometres on roads with no traffic at all. It was actually the only section of the entire ride with anything like traffic, and even this was nothing like a UK main road as it had at least a metre of shoulder to ride on. Though the climbs on my second day were not on the scale of the first day, I was enjoying them very much. The scenery was generally fantastic and the climbing much more enjoyable. I was also maybe relaxing into the ride a little more. I had had a very stressful trip over to France, the first day had been exceptionally hard. But now, I was getting into the flow of the ride and enjoying it far more. I always find, even on a regular 600, that it takes a day to shake off the stresses of everyday life and start appreciating the ride more and more. It was also getting very warm indeed, and the day topped out in the high 20s, and that felt marvellous. I reached the town of Benabarre and stopped for lunch, a huge plate of beans and sausage followed by rabbit with garlic sauce. It was superb and actually the first proper hot food I had eaten on the ride so far. Really set me up for the rest of the day. I also noticed my back tyre was soft – looked like a slow puncture, so I gave it some air and hoped for the best (and it worked until the hotel that night with only one more top up). If you thought the Buddhist temple at Eskdalemuir was remote, the one I passed in Panillo was something else! If you needed to get away and contemplate life, the universe, and everything, then 1000m up in the remote Spanish Pyrenees is a pretty good place for it. 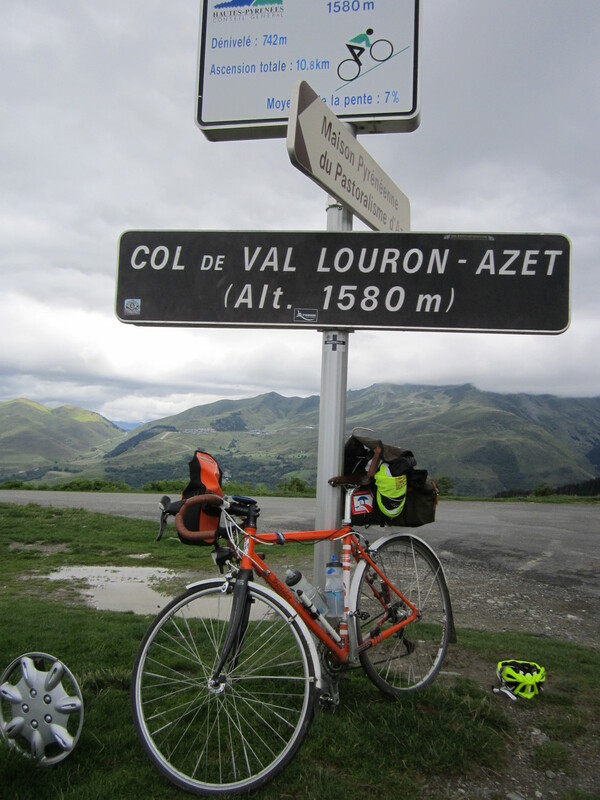 I was tempted to give it all up and go and live there; but I would probably have to give up the bike as well, so I stuck to meditating on the slopes of some amazing climbs. The day's schedule had me riding around 200km, and progress was quicker today due to the climbing being considerably gentler (though I was still climbing around 4000m in that 200km, so this was still a tougher day than most 200s in the UK). This put me at my hotel around 8 to 9 pm. It was going to be a bit odd as I'd have to be out of the door around 4am, but that's the way it is. The sun started to go down as I climbed through the fabulous water-sculpted shale landscape towards Los Molinos as I passed my last control of the day (a tourist information panel in the middle of nowhere). I reached the hotel, checked in and enjoyed a good meal at the bar whilst I assessed my progress and worked out what time I had to leave and so on. Another good sleep and shower and I was off into the dark. Except I wasn't. The front door of the hotel was completely locked. I had a search around and found the garage and a magical side door that led to the outside world. I went and got my bike from the lobby and exited via this door. I was pretty relieved, I had visions of failing the ride due to not being able to get out of the place and I certainly didn't fancy trying to find where the manager slept and waking them up at 4am! It was surprisingly warm as I got going, which was a bit of a pain as I had been expecting the cold to be as it had been the previous night, so I had put on lots of layers. I was soon having to strip off and it was a very pleasant night for cycling. The ride started with a climb up a huge gorge on a very narrow steep road. By the sound of the river below, the rain that had fallen a few days previously was still making it's way to the sea. I felt that I was missing out on some amazing scenery due to the darkness, but that is the way it is sometimes. I did stop a couple of times and marvel at the stars. Living in London, I don't get to see them often! The final day promised to be difficult, I had around 14 hours to cover 160km, but there were several hard climbs including two 1700m passes, one of which was Col d'Aubisque. I knew that the final 30km were primarily downhill, so was confident if I summitted Col d'Aubisque with a couple of hours to go I would be fine. So I hoped to be able to relax and enjoy the day. The terrain had other ideas and before too long I was grovelling up the Col du Pourtalet to cross into France. This climb was the high point of the day and was really quite challenging by itself. With a strong headwind, it was very difficult and it was actually the first time I had to engage my bottom gear on the trip. I was very relieved to reach the top and cross into France and enjoyed the huge descent down towards the base of Col d'Aubsique. I stopped off in Eaux-Bonnes for a spot of light lunch before the climb. I was clearly back in the main cycling areas as there were groups of slickly dressed cyclists arriving in mini-buses to head off up the next climb they wanted to tick off. An interesting way to approach cycling, but if that's what they wanted, then fair play to them. 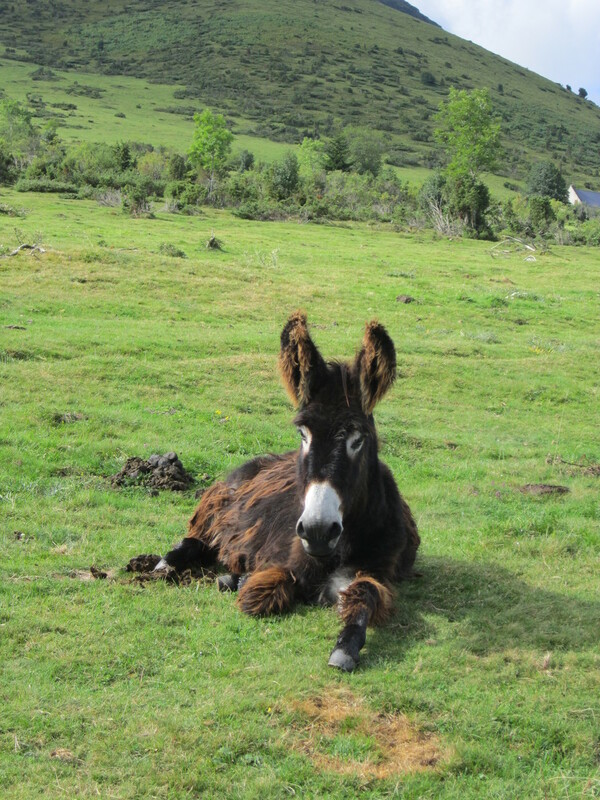 This trip had shown a side of the Pyrenees that they would never see and that is their loss. At this point, I would have happily swapped my steel Condor for one of their carbon creations with no luggage though! 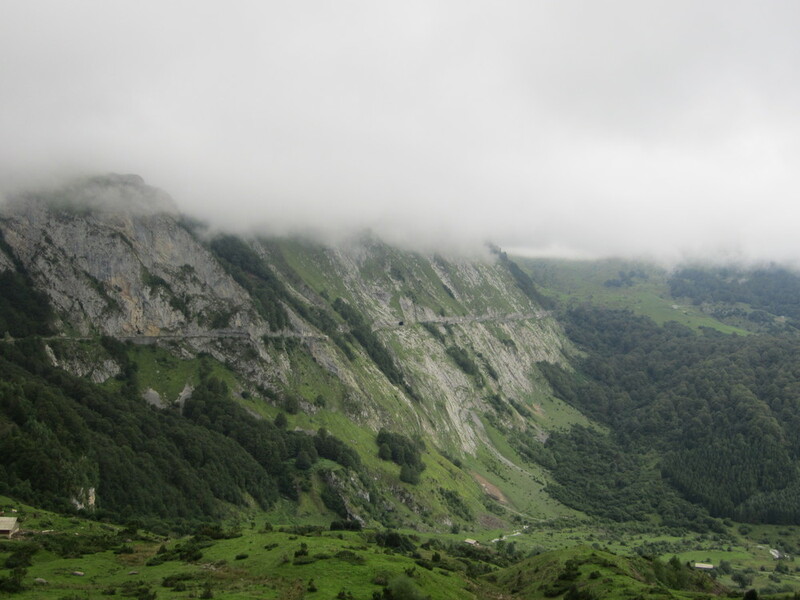 The climb of Col d'Aubisque from Eaux-Bonnes was around 13km long with several sections with sustained 10% gradients. It was a very hard steep climb, but I felt okay. I was looking okay on time, I thought I would arrive at the finish with an hour or so in hand. It was very warm on the lower slopes and it felt brilliant to be on another famous climb (though the more famous side of this Col is the other side I believe). As I climbed towards the top, the clouds closed in on me and it got considerably colder. I was very pleased to reach the summit and throw a jacket on. I took my photos of the control point and headed to the café at the top for a quick coffee and Orangina. There was a roaring fire in the place, and it felt lovely and warm after the cold. Made me realise that they really are very close to winter already and the contrast to the Spanish foothills and high 20s was quite amazing. The descent to the foot of Col du Soulor (a tiny little 200m bump from this direction) was amazing, it is a view I won't forget, with the clouds hanging over the thin string of a road that clings to the side of the mountains. Down, down, down, up Soulor. I was there! I had 20km to go and it was all downhill. I cruised down the last section, and reached the sign at the entrance to Argelès-Gazost, which was my final control. 59 hours ago I had been at the exit sign on the other side of town. Since then I had tackled some of the toughest cycling I had ever done. There were plenty of cyclists milling around Argelès-Gazost, and it does look like a great town to base yourself as you are in striking distance of many great climbs such as those I had done and others (including Hautacam, Col d'Aspin and more). I didn't stop for long. I wanted to get to the hotel, have a look around Lourdes, eat and then pack the bike up. So, 15km back along a superb Voie Verte and I was back to Lourdes, where I cleaned up and went to explore the town a little (see the grotto and the shops full of devotional items of tat). This trip was a superb 4 days away from home. The stress of the travel at the start was worth it. This ride was a very special adventure that was completely different to most other 600s. In some ways, I had under-estimated it. I knew it would be hard, but maybe not quite how hard climbing for sustained periods of time really is. I'd ridden some very tough events this year (the Wessex SR and the Pendle 600 amongst others), so I was expecting it to be a similar level of challenge with slightly less stress about time. The ride was exceptionally difficult. Very little can prepare you for climbing for an hour plus (up to 2 hours at times), descending for half an hour, climbing for an hour plus, descending for half an hour and repeat until bedtime. I struggled at times and had some concerns about whether I would finish the ride. On the other hand, the time pressures one feels on a hilly 600 in the UK were not there. I stopped for two decent sleep stops with about 6-7 hours in a hotel. I was able to stop and take photos when I wanted, I didn't spend as much time enjoying the local cuisine as I would have liked, but that was partly due to the lack of facilities. I can highly recommend this ride, and I am sure the other three Super Randonnée are equally superb. Sophie says this and the Dauphiné Gratiné are the two hardest rides of the series. Each of the rides can be ridden either as a Randonneur, or a Touriste. The Touriste requirement is to ride at least 80km a day. As I rode around this region, I did think that it would make a great route for a 5 or6 day tour, and am considering it as an option on the tandem with Cass. This ride has a fairly short window for riding it each year – the high passes will not be passable until late May/early June and the weather by October will cause the pass to potentially close by then. Even if the passes aren't closed, I wouldn't want to be going over them in the early morning/night-time cold within a couple of weeks from when I did. Preparation is key. In the high summer, you could certainly sleep out in a bivvy bag and this would enable some flexibility to plans. But, if you are soft like me, and want a proper bed, then hotels need to be planned in advance. The split I chose worked well, I missed some great scenery on the last morning, but that was unavoidable I think. I would have only ended up climbing up the gorge at night anyway. If you fancy something very different to a standard UK 600, and a real adventure then I suggest you explore one or more of these magnificent routes and book a flight over the Channel to go and hit the hills. They are very special rides that will give a sense of achievement unlike any UK 600 (even something like the Pendle, the hilliest 600 put on in the UK, so far). They will test any rider with a very different demand on your body compared to a UK ride with generally choppy up and down characteristics. But they are very achievable and even allow for a proper night's sleep. They are not to be rushed, but to be savoured. They will show you views that will take your breath away. Whether you tackle them as a Randonneur or a Touriste, they will reward you throughout the ride and give you a warm glow for days afterwards (and not just from your sore knees!). Newer PostSo, you're thinking about Paris Brest Paris 2015 then? Older PostThe Audax season is over!